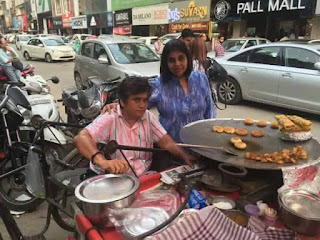 Rekha Chole Tikki Stall, this is located in South Ex. Delhi. She has a three tier rickshaw and operates in a small cart at this place in Delhi. It is such a great inspiration to learn from her. It is a great lesson to learn for them who are fully fit and fine, but still find begging as their profession. She needs to be highlighted as an inspirational soul. She does this all just to meet her regular expenses. When i met her last weekend, it was such a memorable moment for me to listen up her story. She prepares this all stuff ready herself and serves the customers at her cart. This is called a laborious hard worker. Everyone needs to learn something from her. We all go for eating out at costly restaurants, this is a humble request to you all to visit her for atleast once. This will surely help her a lot, whether in the terms of finance or morale. And it feels good to ourselves meeting such personalities. Visiting her will not only boost her morale but it builds a self respect within us. Anyways this is a personal choice to visit her or not. And let me tell you one thing that her Chole-tikki are delicious too. She has a good taste in her hands. Rekha lost her legs before 30 years when she was only 12. You can easily locate her near the Bata showroom in South-Ex., Delhi.